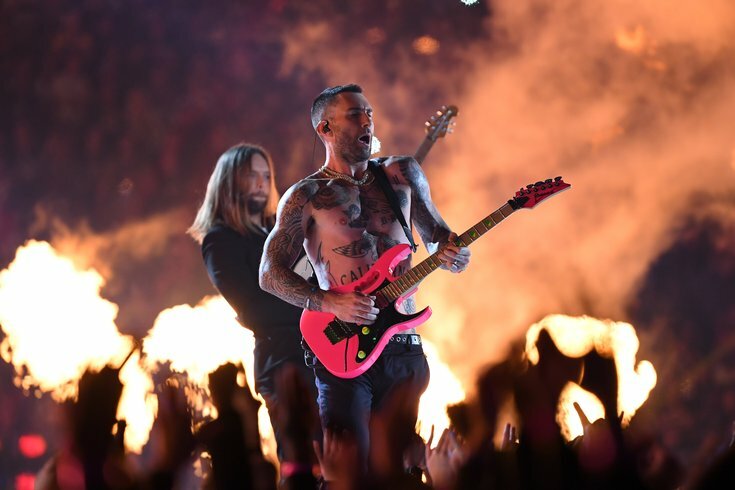 Maroon 5 lead singer Adam Levine went through three coats and then just went shirtless during Super Bowl LIII's halftime show. Last night the New England Patriots defeated the Los Angeles Rams in the lowest scoring Super Bowl game of all time, yet the game's halftime show starring Maroon 5 may have broken a similarly low record. The set was spearheaded by Maroon 5 frontman Adam Levine, who went through three coats and ended the show without a shirt on, and featured "surprise" appearances from Travis Scott and Big Boi, as well a full gospel choir and an homage to late "SpongeBob SquarePants" creator Stephen Hillenburg. With the score going into halftime just 3-0, there had been hope the show would be an entertaining reprieve from a fairly boring game – but the consensus among many is that ... it was not. Here are some of the best hot takes, and just funniest Tweets, from the show. Adam Levine looks like if Target designed a rock star. Maroon 5 please put your shirt back on. is Maroon 5 the new Nickelback? Others saw Levine on the screen and may have seen a familiar comfort. Why exactly was the show so bad to so many people? Several other performers, including Cardi B and Rihanna, also had been approached to star in the unpaid gig, but were turned off from accepting it because of the NFL's treatment of former San Francisco 49ers quarterback Colin Kaepernick. Kaepernick remains unsigned by any NFL team after kneeling in protest during the national anthem, which he first did in fall 2016. He has explained he kneeled during the anthem to raise awareness about police brutality and racism against African-Americans in the U.S. Some of Kaepernick's supporters posted reminders of that reality during the halftime show. “I got to sacrifice a lot of money to perform,” Cardi B told the Associated Press a few days before the Super Bowl. So is the Maroon 5 performance the worst Super Bowl halftime show ever? It may rank up there. Here's a look at some other acts notoriously ill received, including Gloria Estefan's 1992 performance that was basically a long Olympics-themed spectacle that couldn't even be saved with covers of Queen songs.